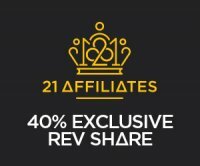 Twenty One Affiliates is the partner program for 21casino.com. They have licenses in the UK and Malta and offer casino, mobile casino and live dealer games. Although it's relatively new, Twenty One Affiliates has one of the best (if not the best) commissions for its partners. This affiliate program is actually a part of the larger Imperiumn Uffiliates program. As such, affiliates who join the program will be promoting brands that are exclusive to Imperiumn. These brands are some of the most popular in the industry. This means that there's going to be a possibility that you'll have high conversions from referring your visitors to these brands. What's great about Twenty One Affiliates is that it was created by someone who used to make a living as an affiliate. Because of this, most of its policies favor the affiliate partner rather than the promoted brand. This is most evident when you check out how much affiliates can earn through the program. Affiliate partners can get as much as 55% of the net revenue that is generated by the brands from their referrals. Like with most affiliate programs, Twenty One Affiliates has a commission structure that pays a percentage based on the number of new players an affiliate refers per month. For the lowest tier in this structure, affiliates who refer 0-4 new players get a sizable 35% commission. With 5-9 new referred players per month, the affiliate will see the rate for his/her commission increase to 40%. In the event that an affiliate refers more than 35 new players, he/she can then get a commission amounting to 55% of the net revenue generated by his/her referrals. The Twenty One Affiliates program processes payouts for commissions once a month (the 15th) provided that the amount has reached at least €100. Once the amount has been credited to the affiliate's account, he/she can use three payment methods for withdrawals: Bank Transfer, Skrill, and/or Neteller. In terms of transparency, affiliate partners have access to comprehensive data that they can use to track the progress they're making with their referral strategies. For affiliates, this information is vital since it can help improve commissions as well as conversions. Complementing its tracking system, the Twenty One Affiliates program provides its partners with all the promotional materials they'll need to spruce up their affiliate sites. These materials include web banners, mailers, and even customizable banners. In the event that they encounter any issues with using these tools, affiliates can get in touch with the program's support team through this email address: help@twentyoneaffiliates.com. There are also affiliate managers available 24/7 to help affiliates deal with whatever issue they might have encountered. Perhaps the best thing about the Twenty One Affiliates program is how it rewards success. More often than not affiliate programs are just content on giving affiliates what's due to them based on their referrals. Have you ever heard or read about an affiliate program that rewards its partners with a Fiat 500X, a €10000 Travel Cheque, or a €5000 Amazon Gift Card? These are the prizes that await the affiliates who do well enough to get in the top 3 positions of the Twenty One Affiliates program. The fact that it is still relatively new compared to more established affiliate programs shouldn't discourage you from giving Twenty One Affiliates a try. You might find yourself with a brand new SUV or a trip to Las Vegas if you work hard and get outstanding results.